Information to power your genetic testing decision. Ready to take the next important step toward genetic testing? At Eye Want 2 Know, you’ll find a tool to help locate heath care professionals in your area who are able to help facilitate genetic testing, as well as other important tools that may answer the ultimate question: What is the underlying cause of my IRD? Two moms—one who has retinitis pigmentosa (RP), and one who is raising a daughter with a form of Leber congenital amaurosis (LCA due to mutations in the IQCB1 gene)—talk about the importance of genetic testing. Genetic testing: mapping your future. 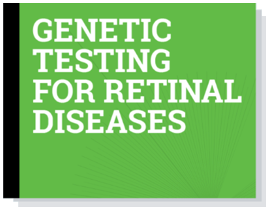 Anyone with an inherited retinal disease (IRD) should consider genetic testing. Genetic testing may be able to identify the mutated gene (or genes) responsible for your vision loss. Armed with this important information, you and your doctor can then determine the best course of action for your disease and discuss how clinical research might apply to you. You won’t know if you’re a candidate for gene therapy clinical trials until you know your genetic mutation. Ready to take the next important step toward genetic testing? 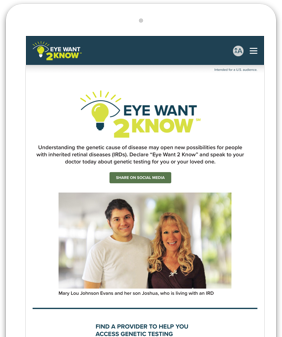 At Eye Want 2 Know, you’ll find a tool to help locate health care professionals in your area who are able to help facilitate genetic testing, as well as other important tools that may answer the ultimate question: What is the underlying cause of my IRD? The science behind genetic testing may be deeply complicated, but the testing procedure itself can be relatively simple. An exam with a retinal or IRD specialist provides you with important baseline information about your disease. It could also generate a clinical diagnosis, if you don’t have one already, which may help narrow the search for your mutated gene. Meet with a genetic counselor. Even if you’ve met with a genetic counselor before, you may want to do so again because science is always changing. A genetic counselor can help you understand the importance of identifying the genetic cause of your disease. Once your doctor orders the test, he or she will collect a saliva or blood sample and send it off to the genetic testing lab. To provide a blood sample, expect the same kind of simple blood draw that is done for any other kind of common blood test. It can take several months to receive the results from your genetic test. Discussing the results with a genetic counselor or a health care professional will provide you the insight needed to determine your next steps. The story of Tyler Kitchengs and his grandfather illustrates the remarkable advances scientists have made in genetic testing and gene therapy research over the last four decades. Tyler’s grandfather didn’t have options when he was diagnosed with retinitis pigmentosa in 1976. Today, the newly diagnosed—like Tyler—pursue genetic testing in the fight to save their sight. This is only general information about genetic testing. Each individual’s situation and experience will vary. Always consult your healthcare professional when making decisions about eye health or genetic testing. If you’d like more information about genetic testing, or need a helping hand in getting started, sign up and we’ll be in touch. Resources to help you understand IRDs. Our resources page provides links to more good information about genes, inherited retinal diseases, and genetic testing.